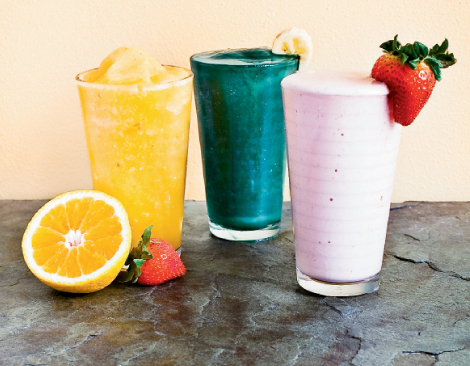 Sugar Mountain Café in Avery County serves quick bites, but the 40 plus smoothies on the menu offer just what’s needed to declare immunity and kick-start the new-year, new-you resolutions. Co-owner Greg Levy opened the café last summer with his wife, Kelsey, and mother, Deena. Forget the frozen berries; using real fruits, fresh squeezed juices, and natural sweeteners such as agave nectar are key, he says. Here are Levy’s recipes for energizing smoothies. The Mountain Sunrise is fresh and light; Immune Booster packs a nutritional punch; and the signature Plus is frothy and filling.